Begin an exercise program to increase coordination and balance. Take a list of ALL of the medications you are taking to your pharmacist. Include ALL prescriptions, vitamin supplements, over the counter medications and herbs. Combinations may cause dizziness and a fall. Have your vision checked at least once a year. Poor vision can cause a fall. Make your home safer by de-cluttering the floor, increasing lighting, installing grab bars in the bathrooms and railings on BOTH sides of the stairs. 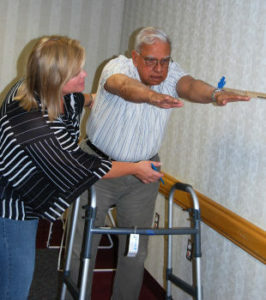 The Center for Disease Control and Prevention has developed a Fall Prevention Program that is community based. The Northern Virginia Fall Prevention Coalition presents FREE Seminars to educate the general public and those in the medical profession on how to prevent a fall in our senior population. For information on upcoming Seminar locations visit NVFPC.ORG.